Jump off a 50m-tall tower, swing through the air or walk down a vertical skywalk at AJ Hackett Sentosa. Adrenaline-seekers, get ready to bungy jump. This exciting activity is now available here, with the official opening of adventure tourism company AJ Hackett Sentosa last week. And with other attractions adding new features and updating their offerings, thrill-seekers now have more choices to get a rush. AJ Hackett Sentosa, which belongs to a group that originated from New Zealand, is behind Singapore's first and only bungy tower, a 50m-tall purpose-built structure that can be used for different aerial activities, such walking down a vertical skywalk or swooping through the air while strapped into a giant swing. Its most popular activity is the bungy jump, where guests leap off from a height of 47m and can attempt different jump styles, such as a classic swan dive, the backflip, or while blindfolded. There is no age requirement for this activity, but participants must weight between 40kg and 150kg. Visitors are put into a harness and their ankles are strapped to a rubber bungy cord. They then leap into the air and experience two heart-palpitating seconds of free-fall. The giant swing (above) at AJ Hackett Sentosa swings up to speeds of 120kmh, while Wild Wild Wet’s Royal Flush lets riders swirl down fast-moving waters on a raft and experience a stomach-churning drop. Below is a 3.5m-deep aerated pool and guests can choose to end the jump suspended in mid-air, or to have their head and shoulders dunked into the water below. Close to 4 million people globally have experienced the bungy jump at the group's various jump sites in countries such as Australia, France and Russia. Its Australia site, for example, is located in a rainforest which is a 20-minute drive from the Cairns central business district, while its Russia site offers a beautiful view of the Mzymta River nearby. AJ Hackett Sentosa says that up to 20 people here try the bungy jump every hour on weekend evenings. Also on offer are less intense but exciting activities. Take the giant dual swing - the first in the world - where two groups of participants can swing 47m off the ground and, upon release, swing back and forth at speeds of more than 120kmh. Up to six people can swing at one time. There is no age requirement, although participants must be 1.2m or taller. There is also a vertical skywalk, which is the first of its kind in Asia, where participants can walk 45m down the side of the tower while facing the ground. The giant swing at AJ Hackett Sentosa swings up to speeds of 120kmh, while Wild Wild Wet’s Royal Flush (above) lets riders swirl down fast-moving waters on a raft and experience a stomach-churning drop. This activity is commonly used by military and uniformed forces for training operations, says the company. Participants have to be at least 14 years old and weigh between 40kg and 110kg. People who take part in AJ Hackett activities have to sign a waiver at the point of registration and are solely responsible for their own physical and mental state of health. In addition, the company has a 40m-long open-air skybridge, perched 50m above the ground, with some see-through sections. From this bridge, guests can enjoy views of Siloso Beach, an up-close view of jumpers leaping and swinging off the tower and take awesome photos. AJ Hackett Sentosa is owned by Kiwi Alan John Hackett, who set up the world's first commercial bungy site in New Zealand in the 1980s. The Singapore jumpsite expects to attract more than 150,000 visitors a year. 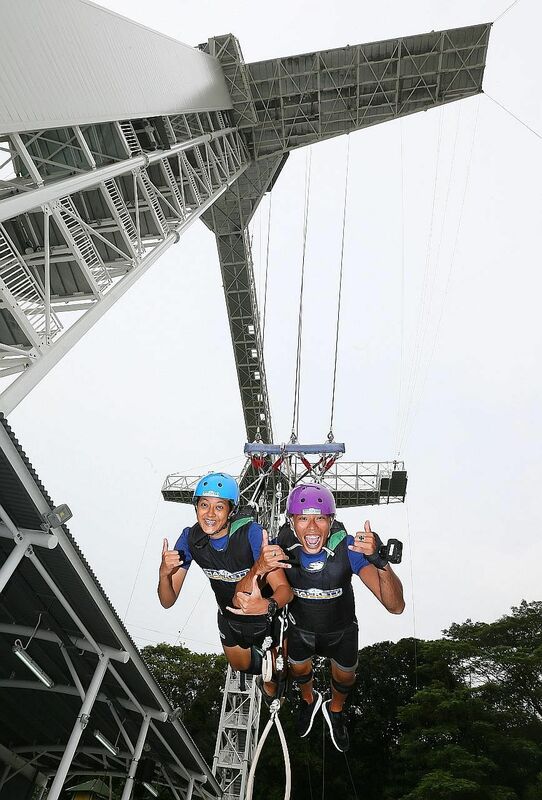 Mr Nik Ang, 45, AJ Hackett Sentosa's sales and marketing manager, says its activities empower participants to conquer their fear of heights as well as of the unknown. "Our jump masters do not push or force a jump, swing or vertical skywalk. Customers do the activities on their own accord and take away with them the lesson of over coming challenges in life." The safety of its customers and crew, he assures, is of the utmost importance. "Bungy jumping is safer than flying in an airplane." He adds: "All our jump crew are highly trained to the highest standards of jump master accreditation and complete regular refresher courses through an independent trainer." Mr Ang believes there is demand for such extreme activities here. He says: "There is no better time as Singaporeans are becoming more adventurous and crave new experiences. Our company offers something very thrilling for them, something that they will never forget." Mrs Vanessa Henry, 42, an Australian tourist who did the bungy jump on Tuesday, says: "I was scared when I was up there and nearly didn't do it, but I thought, I'm just going to do it. "I was free-falling and had a great view of the beach. Very nerve-racking, but great fun. I had a ball." At nearby attraction Skyline Luge Sentosa, two new luge tracks and a new Skyride were officially launched last month as part of a $14-million update of the attraction. With the two new tracks, guests taking the luge ride - where they travel in a three-wheeled cart driven by gravity - can expect shorter waiting times. These new tracks are also specially designed with hairpin corners and exciting slopes. The water theme park Wild Wild Wet at Downtown East has also recently undergone a revamp, which was completed in April this year. It is now twice its original size. Since the revamp, four new rides have been launched. 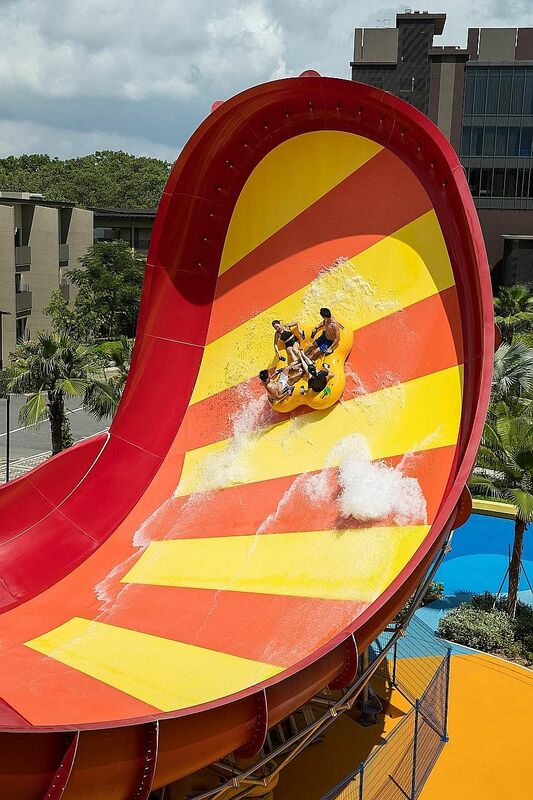 There is the thrilling Free Fall, a six-storey-high free-fall water slide, and Royal Flush, a hybrid ride where guests swirl down fast-moving waters on a raft and experience a stomach-churning drop. Guests on the new Vortex ride, Singapore's first high-speed 360-degree extreme loops ride, will get sucked into a world of extreme turns and curves at a break-neck speed of up to 10m per second. Those taking the Kraken Racers ride, Singapore's first four-lane mat racer slide, can race with friends and family as they zip down the slide lanes. Downtown East's general manager, Mr Ronnie Tan, says: "These high-thrill rides have been highly popular and monthly park visitorship has almost doubled since our revamp was complete." Student Ryan Tew, 10, who took Free Fall ride earlier this year, says: "It was a bit scary at the top because the ride is very high, but the free fall was really fast and shiok (enjoyable)." Student Javier Wong, 21, who took the ride about a week ago, says it was "the best water ride I have ever taken in and out of Singapore". "A large part of the ride involves a long fall, and you feel nothing below your legs. It was so thrilling and gives such a rush."